After nearly 25 years, U.S. manufacturer Monmouth Rubber and Plastics Corp. puts the Neoprene ‘Made in America’ label back on an iconic American product. Some products are just synonymous with America. But these days, your grandma’s apple pies are one of the few products that are actually still made here. During the past few decades, many U.S. manufacturers have been outsourcing the production of some of America’s most iconic products to cut down on manufacturing costs. Even America’s greatest pastime, baseball, is played with balls stitched together in Costa Rica; and many of Mattel’s most iconic American toys, like the Barbie doll, are now made in Hong Kong. The neoprene Wetsuit is another true American icon. It symbolizes the ‘surf culture’ that has evolved from denoting the 1950-1960s carefree waterlogged rebel with a tanned muscular build and sun-bleached hair, to now reflect more contemporary attitudes which embody freedom, adventure, the responsible use and care of our planet’s natural resources, and the possibility to explore uncharted territory in a different type of world found under the deep blue sea. 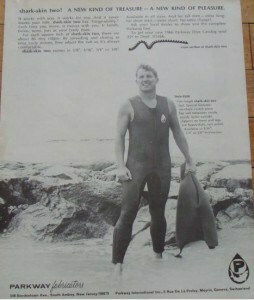 However, there was a time when wetsuits didn’t exist. Certainly the Hawaiians had no use for them with their year-round endless summer. But once the addictive sport was exported to California, surfers dived in to the sometimes-frigid Pacific Ocean, and the dire necessity for insulation took on urgency. As we all know, necessity is, indeed, the mother of invention! THE FIRST WETSUITS EVER MADE. 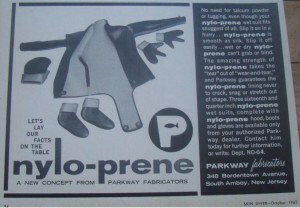 The story of the birth of the neoprene wetsuit is actually quite an interesting one. It begins back in the late 1940s and early 1950s in the town of South Amboy, N.J. A company called Parkway Fabricators & Weiss Clothing was in the business of manufacturing men’s clothing suits. Dan and Fred Weiss, the sons of the owner, were seasoned drysuit scuba divers. In the type of drysuit they used, air was pumped down to the head chamber so the diver can breathe under water for prolonged periods of time. During this same time period in Bedford, Virginia, Rubatex Corp. began manufacturing a material made of 100% neoprene rubber in a sheet measuring 40″ x 120″. This material was known as Rubatex G231N. It was manufactured through a unique process using a nitrogen gassing chamber. At that time, no other company had a gas blown material, and more importantly, no one had a 100% neoprene material with the high physical properties of the Rubatex G231N. Dan and Fred Weis discovered the existence of Rubatex G231N and came up with the idea of using it to make an insulated wetsuit to help keep divers warm in cold water temperatures. Since they were both Cloth Cutters by trade, they were well-versed in cutting shapes out of various types of materials to make a suit. The first wetsuits manufactured actually had a skin on one side of the neoprene material. There was no fabric lamination. Talcum powder was used to stretch the material over the skin. The Weiss brothers introduced the concept to the U.S. Navy and subsequently, Parkway Fabricators became the worldwide leader of making wetsuits in an exclusive arrangement with Rubatex. Several years went by, and in 1962 the Japanese introduced a new type of chemically blown wetsuit material. It soon found its way into Taiwan. Over the next 25 years, the Japanese in concert with the Taiwanese became the worldwide leaders in manufacturing wetsuit material. The Taiwanese added textured designs to the rubber surface and fabric laminations – commonly referred to as four-way stretch nylon. By the early 1990s, Rubatex Corp. was no longer a contender in the wetsuit market, and by the turn of the century, there was no more skin diving material made anywhere in the United States. With Rubatex G231N now knocked off the market, the only neoprene material available was chemically blown, and it could only be found outside of the U.S. Unfortunately, many companies who purchased the imported ‘knock offs’ discovered they simply didn’t measure up to the quality of the previous material made by Rubatex. For many years, Gasket Cutters, Fabricators and OEMs searched worldwide for a manufacturer that could match the quality of Rubatex G231N. Then in July of 2012, Monmouth Rubber & Plastics Corp., with its proprietary technology, decided it was going to be a game changer. It announced new Rubatex equivalents that now complete the full line of obsolete Rubatex stocks – including G231N and G207N, which customers found impossible to find suitable replacement materials. 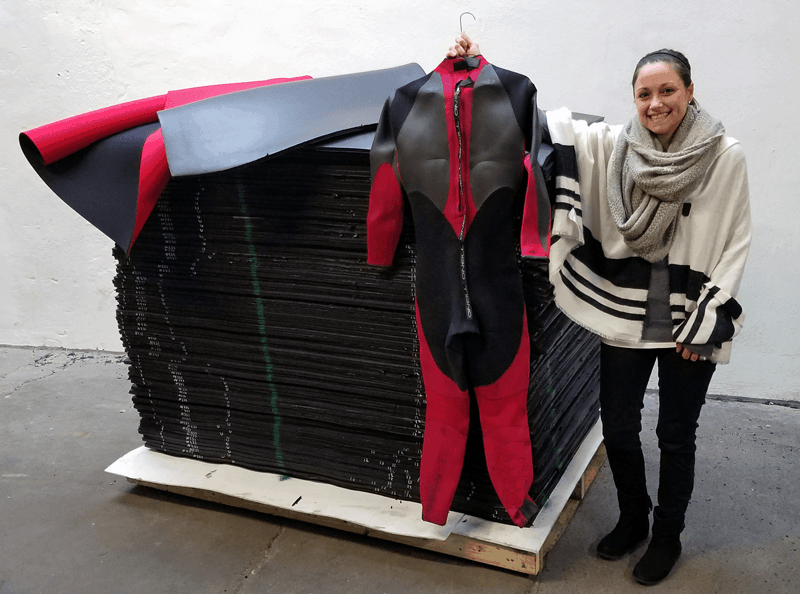 As a result, doing so brought the production of neoprene wetsuit material back to the U.S.A. with the development of a product called Durafoam™ N231. Durafoam™ N231 is a 100% neoprene closed-cell rubber material EQUAL to the physical properties previously exhibited by G231N Rubatex material. Through the results of extensive product testing and performance, and the unique superior physical properties of this flagship material, the sales of Durafoam™ N231 have skyrocketed. Gasket Cutters, Fabricators and OEMs were ecstatic that they could finally, once again, match the quality of Rubatex G231N with the newly developed technology of Durafoam™ N231 – available only at Monmouth Rubber & Plastics Corp. in the U.S.A.
Just to give you a little background on Neoprene – or the chemical name Polychloroprene (CR) – it is a specialty type of synthetic rubber that is produced by the polymerization of chloroprene monomer. It has a diverse combination of technical rubber properties that are quite unique amongst synthetic elastomers, which makes it a very desirable and versatile material. Applications vary from molded goods, cables, various types of belts, profiles, adhesives, and of course, sponge or wetsuit material. CR has good mechanical strength; high ozone and weather resistance; good aging resistance, low flammability; good resistance toward chemicals; and moderate oil and fuel resistance. Unlike other neoprene products, Durafoam™ N231 is not oil-derived. It is also not dependent on Butadiene Monomer or Petrochemicals – so less oil use means lower carbon emissions into the atmosphere. The manufacturing process is GREEN because the raw material is based on Limestone, a sedimentary rock that can be found naturally throughout out the world. Through the Acetylene process, Limestone is converted to Chloroprene Monomer to ultimately make Durafoam™ N231 – which is used by Gasket Cutters, Fabricators and OEMs to make all kinds of end products – including neoprene wetsuits. The fact of the matter is, all U.S.-based manufacturing underpins a wide range of homeland jobs that stretch far beyond the common icon of factory line workers and machines. U.S. manufacturers additionally support higher-skill jobs that include accountants, bankers, lawyers, and other professionals that are associated with any industry, as well as a wide range of other jobs including research, technology development, product and process engineering and design, operations and maintenance, transportation, testing, lab work, and marketing. So why has Monmouth Rubber and Plastics Corp. refused to jump on the ‘outsourcing bandwagon’ perchance to increase its own personal profits for the past 50 years? The company also provides a free technical support program called “Ask John” which provides customers (and potential customers) FREE technical information and guidance on a multitude of rubber and plastic questions and problems. This complimentary service offers real value to OEMs, Fabricators, and Suppliers because it allows them to obtain expert advice along with access to a comprehensive technical library at their fingertips at no cost. Monmouth Rubber & Plastics Corp. is a leading manufacturer of closed cell sponge rubber and plastic foam products. Visit the company’s website at www.MonmouthRubber.com to learn more about its green manufacturing practices, as well as its recycled rubber products, and flagship Durafoam™ N231 used to make neoprene wetsuits. For more information and free samples, please be sure to stop by and say hello to Monmouth Rubber & Plastics Corp’s team at the upcoming GFA Gasketing/Converting Expo in Orlando, FL, March 25 – 27, Booth #6. FOLLOW US ON LINKEDIN TO STAY UP ON MONMOUTH RUBBER AND PLASTICS CORP’S LATEST DEVELOPMENTS.